The leading crowdsourcing platform for marketers, eYeka, was founded in 2006 by French entrepreneurs Gilles Babinet and Franck Perrier. Launched in beta in 2007, eYeka was designed for "everyone with talent and ambition" as a participatory website that provided an experience "[like] TV on the computer with quality programming" (source). eYeka was positoned as a new generation platform on which creatives and brands could connect and exchange. As of today, eYeka has hosted over 900 contests for brands and agencies to involve consumers in their innovation and communication efforts. The community, which is over 330,000 people strong, has submitted more than 100,000 ideas to these competitions, and the winners have shared over € 6,000,000 in prizes. 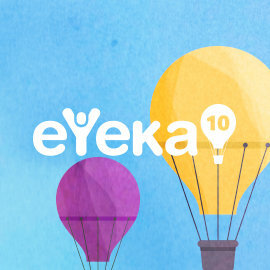 To celebrate the anniversary, eYeka is publishing an infographic that shares some of the company's biggest milestones in the last decade ("eYeka’s Story - 10 Years of Connecting Brands and Creatives") as well as a special logo that will be displayed on its website. In an effort to associate the community to the anniversary, eYeka is also launching a contest in which members can propose their own versions of the logo. The winning designs will be used on the platform throughout the year, winners will share € 1,500 in prize money and will be featured in a dedicated blog post.